When you finish reading a book of a stature such as “A Visit from the Goon Squad” by Jennifer Egan, you sit down, breathe and keep breathing, till the breath paces itself out and you aren’t gasping anymore. The effect of books has to be this way. It has to have the maddening reaction in a reader – the gasping, the constant thinking about the characters and more so how would their lives turn out after the book is finished. Would they have a life at all once the reader has ended the reading? Would he or she go back and revive them? If a book can evoke these thoughts, then it is of the most superb quality writing that existed. “A Visit from the Goon Squad” is all about lives being lived and the ones that were lived in the past. The book according to me is all about memories, failed lives, failed loves and how somewhere in all of this, there is this bleak thought of giving hope a chance and seeing where life goes thereon. There is nothing sugar coated in the book. Egan gives the reader, “life” the way it is – harsh, uncompromising, difficult and sometimes worth living just for all of that. Bennie is an aging former punk rocker and record executive. Sasha is the young, troubled woman he employs. The book is essentially about their lives, their pasts and how it all merges into one big fascinating book. Egan takes us through generations and different people through the two protagonists. The other characters are integral to the plot, because through them Bennie’s and Sasha’s lives are shown to the reader. The larger themes of the novel – loneliness, despair, a lost generation, materialism, the quest for happiness is so deeply embroiled in the book that the reader would find it very difficult to disassociate his emotions from them. The story skips back and forth in time, so initially, I did face some problem reading it, however once I got the hang of it, it was a breeze of a read. The passage of time is at the core of this book, with Egan orchestrating the entire book and making it fall into place with each character’s life revealing itself in each chapter. I loved the second last chapter of the book, which is in the form of a Power Point Presentation. This is the uniqueness that I look for in books at times and it was superlative in this one. Egan’s characters are most humane and that is the most heartbreaking quality they possess. They make their mistakes, going through life, wanting to rectify it all, wanting that one chance at redemption to make things the way they were and this is where I most connected with the book. 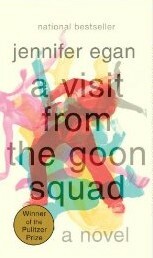 “A Visit from the Goon Squad” is something that will not let go of you that easily. You will relate with it and that is when it will play on your mind and heart, as all great books do. This entry was posted in Anchor Books, Books, Knopf, Literary Fiction, Review and tagged A Visit from the Goon Squad, anchor books, Jennifer Egan, literary fiction, loss, Love, music, Older Men, Young Women on March 31, 2013 by thehungryreader.